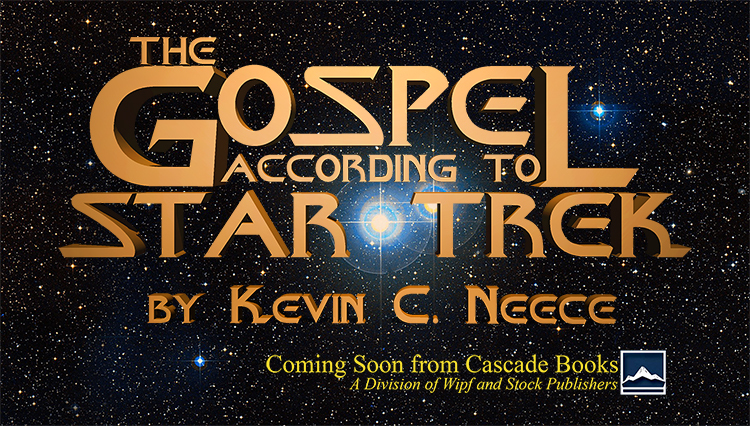 I’m delighted to announce that Cascade Books, a division of Wipf and Stock Publishers, has agreed to publish The Gospel According to Star Trek! I’m honored to be with the same publisher as noted authors like Stanley Hauerwas, Jürgen Moltmann, John Milbank, John Howard Yoder, Margaret Miles and Walter Brueggemann. Perhaps we need to ask better questions―questions like, “How is Star Trek congruent with a Christian worldview?” or “Is Star Trek really atheistic?” or “What can Christians learn from Star Trek?” The answers to these questions are, quite simply, fascinating. Star Trek is the story of a spiritual quest. It is an exploration, not just of the stars, but of humanity―our longings, our questions, our hopes. If that humanity finds its ultimate fulfillment in the gospel (and it does), then it is only logical to expect that such an exploration would naturally show evidence of humankind’s hunger for God. In The Gospel According to Star Trek, you’ll discover how the continuing voyages of the Enterprise and her sister ships (and space stations) tell us more about our need for Christ than we ever imagined. You’ll learn how Star Trek creator Gene Roddenberry’s own theology and spiritual quest have permeated the franchise, about the influence of Scripture on its stories and the amazing images of Christ contained in its most popular characters.